In 2015, June Tibbetts of Terry, Montana was sitting at a 1st Annual Copper Spring Ranch Horse Sale, watching the safer, more broke 2-year-old prospects sell for well above her budget, when a spirited acting two-year-old mare came through the ring. "I thought, 'My golly this is a pretty nice horse,'" the 69-year-old woman says. "I just bid on her and bought her." Never in a million years would Tibbetts have thought that mare would carry her to the Pink Buckle Barrel Race in Guthrie, Oklahoma where she will be running for $1 million, October 5-7. Tibbetts says she has been riding horses from a very young age, thanks to her father, Warner Johnson, who raised a lot of horses near Circle, Montana. She rode their home-raised horses in a small number of Little Britches and High School Rodeos, but says it wasn't until 1983 that she was became serious about barrel racing. "I have had several nice horses in the past," she says. "I dabbled in barrel horses, did it as a hobby. We have a ranch and we ride all our horses on the ranch, so we might as well ride performance horses that we can train." Tibbetts says she has been fortunate enough to ride several talented barrel horses over the years. Mr. Tibbs, a home raised gelding that she paid a 50-dollar stud fee for earned June her WPRA card in 1984. Later her husband, Ron traded 2 large bales of straw for First Lark who carried her to 10 Montana Circuit Finals, 2 WPRA Divisional Tour Finals, and numerous Northern Rodeo Association Finals. In the late '80s and early '90s, Tibbetts brought her own barrel racing career to a halt so she could provide her daughters with the best horses. Both daughters received college rodeo scholarships to Montana State University. "When the girls got through college, I started training horses for myself," she says. "I needed a job along with being a ranch wife." Through the years, Tibbetts says there have been many good horses that her father, herself, and her husband have raised. The first and only horse she purchased for herself was Laced With Talent, or Lacey as she calls her, the mare she bought on a whim that day at Copper Spring Ranch. Lacey is by Prime Talent and out of Just Suede by Feature Mr. Jess, she was bred to run. Tibbetts' daughter, Lana, who is on the ranch and very involved in barrel racing put the first few rides on the mare, then Tibbetts took over her training. "I could see she was coming on pretty good. Lacey has been the easiest horse I have ever trained," Tibbetts says. "Most sensible and all she wants to be is nice. She's honest and focused. My horse shoer loves to shoe her because she's so cooperative." In the spring of this year, Tibbetts began to enter some jackpots with her five year old mare. She kept progressing, so Tibbetts entered her in the Barrel of Gold Futurity at Silesia, Montana. Lacey's twelfth competitive run won the 1st round and a tipped barrel cost her the average title. 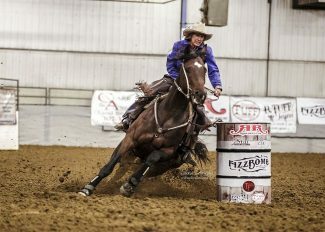 At the Fizz Bomb Classic Futurity in Gillette, Wyoming, Lacey held her own against a tough field of competitors. On September 22, Lacey made her 20th competitive run and placed fourth out of 368 at the Blitz in Bowman, North Dakota. This weekend the duo will be running for big money in Guthrie, Oklahoma at the Pink Buckle Barrel Race. According to the Pink Buckle's website, the barrel race includes an Open 4D & Futurity. The race is designed to increase the number and quality of barrel racing performance horses by promoting the Pink Buckle stallions and their offspring. Lacey's sire, Prime Talent, is one of 40 American Quarter Horse Association stallions which qualifies Lacey to be nominated for and entered in the race. It is considered the richest barrel race in history with $550,000 guaranteed payout in the Futurity, $400,000 guaranteed payout in the Open 4D, $50,000 guaranteed payout in the Amateur Futurity and $20,000 guaranteed payout in the Youth Incentive. Tibbetts considers herself incredibly fortunate to be able to ride a horse with such talent and speed. 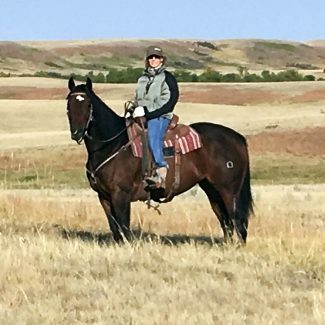 She is grateful to Lisa Anderson of Copper Spring Ranch, Jana Bean, Lana and Ron, who have supported her and shared their knowledge of training barrel horses. "I have been fortunate enough to ride with some really good trainers," she says. "I have picked up a lot of knowledge from people like how we periodically do round pen work on our horses to keep them soft, supple, and quicken their feet." As a grandma, Tibbetts exercises caution in the races she enters. Although she considers herself physically fit, she tries to avoid wrecks at all costs and wonders when her retirement from barrel racing will be. But for now, Tibbetts says she is focused on making the most of her time with this incredibly talented mare, Laced With Talent. "I'm enjoying this adventure with Lacey and I have to give God all the glory, I really do," Tibbetts says. "Who would have thought that I could be going to the Pink Buckle and running at one million dollars. Who would have thought."